Format: Four-way split release in a two-disc set, featuring Onyx and Black Jade on disc one, and Ringbearer and Uruk Hai on disc two. The album comes housed in DVD sized case with full colour covers. The release was issued by Aschefrüehling Records in 2014, no allocated catalogue reference. Well shiver me timbers and avast me hearties! Here's a swashbuckling Tolkien infused feast of music if ever there was: a four-way split of some of the most Middle-Earth influenced bands you could ever hope to wave an enchanted stick at. One can only begin to imagine the scenes of re-enactment that would ensure were these four bands to be let loose in a forest at one and the same time!? Nazgul had held off reviewing this for a while, thinking (in ever hopeful optimism) that a plethora of internet coverage would surely surround such a monumental release as this hitting the planet. But ... and thrice but ... absolutely nothing seems to have been written about it at all. Nothing. Zilch. Diddly Squat. And this is quite perplexing really as clearly a lot of thought has gone into putting this together, from the excellent artwork to the four bands included here. Aschfrüehling (literally: Ashes Spring) deserve much credit for taking on the mantle of responsibility in getting this recording out there, but once again - as commented on in other recent posts - an edition of only 99 copies hardly suggests that they expect the thing to fly out of the shop door. So what we end up with is a highly promising and well polished release from both established and up and coming bands that even within the rarefied atmosphere of its own small genre is likely to have as much of an impact on the musical world as a pancake falling off a table. But no matter, this is the part of the Blog where Nazgul cuts his teeth of these four offerings to see what's hot, what's not, and what's just plain weird. Onyx get the ball rolling, and it's a very piano-heavy approach (or synthesised piano, hard to tell). Now I'm all for a bit of piano - give me a sunny window seat The Damned's 'The Portrait' playing gently in the background and I'm as happy a Nazgul as you'd ever hope to find - but sometimes Onyx's style comes across as a little heavy handed and (dare one say it) a little bit 'plinky-plonky' in nature (call it charmingly naive maybe?). That might sound a bit rich coming from someone who wrote a positive critique of Uruk Hai's "Elbentanz" demo, but what the heck: Nazgul calls it as he sees it. That said, there are some good bits in there, particularly in the first track where the use of bells (but not whistles) gives the music a bit of variation. Ultimately, for me, the weakest set of songs on the album but enjoyable for what they are. Black Jade come next, out of the blue and completely unknown to your scribe. And knock me down with a feather, these songs are really rather good! Using lots of melody amidst a flurry of spiky guitar and immense drumming, killer vocals and utilising a sound not a million miles away from Elvenking and Suidakra at times, Nagul has to say that he greatly enjoyed all of these tracks, and they are amongst the best on this album. There seem to be more than a few Black Jade demos out there, so one to keep an eye on and hunt down methinks. Ringbearer is the creation of Jaron, who has also recently become one half of Hugin's Eismond project. Ringbearer are also to feature on an epic suite of split albums with Uruk Hai in the near future, so clearly a good working partnership is developing on that front. The music here is certainly grounded in all of those elements you might associate with Middle-Earth ambient, augmented at times in unexpected ways: the American Indian flavour of 'The Peoples Of Numenor' being a case in point. Great compositions and solid musicianship mark the songs offered here, which bodes extremely well for the new Eismond release coming soon too! And finally we finish the album with Hugin's Uruk Hai. Many signature touches come to the fore on these songs, the vast majority welcome and excellent, the odd one not so - the length of 'Elbenlicht' may not seem excessive on paper but the simple repetition of the melody in the song does make it seem like it lasts twice as long as it actually does, and it has an oddly lulling sensation to it that can send the unwary into a state of torpor. Everything else sparkles in the Gondolin sunshine, however, and how nice to see an acknowledgement to Gothmog, Lord of Balrogs during the First Age and arguably the greatest Balrog ever to walk Middle-Earth. For those unknowing amongst you (what did they teach you at school?) Gothmog was a wily commander and fearsome fighter, often accompanied by others of his fiery kind, whose weapon was a great black axe. Generally, he caused a great deal of hurt and pain to the forces of goodness over many decades, and Nazgul salutes him for it. Sadly, Gothmog was not indestructible: He led Morgoth's deadly surprise assault on the Hidden City of Gondolin. In the square of the King in the heart of the city, he came upon the Elf-lord Ecthelion of the Fountain. They fought a great duel, and in the end Gothmog and Ecthelion slew one another. So ended one of the most feared denizens of the pits of Angband. 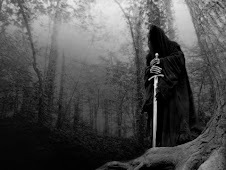 A shame, and Nazgul still lights a candle on his birthday to pmark his untimely passing. In between first and last, 'Gondolin' manages a neo-folk vibe with a (surely?) recycled synthesizer part overlain by a catchy acoustic guitar, whilst 'Ring Of Fire' is a catchy and upbeat instrumental put firmly in its place by the sheer weight and crushing despair that signals 'Gothmog'. This is undoubtedly a tremendous addition to any self respecting fan of any of the bands, or of Tolkien influenced music as a whole. There's plenty of avenues to lose oneself in the wonders of other magical realms, and though there are peaks and hollows on the journey the general consensus is that this is a release well worth seeking out.